The old storytelling styles of Tolkien and Lewis have been re-born and pumped with steroids. The wildly creative work, “Escape to Clown Town” has finally launched. The magical tale is the first in its 6 book series and is predicted to make waves. CHICAGO – Jan. 13, 2018 – PRLog — “Escape to Clown Town” is a new breed of writing that embraces innocence and fearlessly tackles the true meaning of evil. Inspired by the old works of Tolkien, Lewis and Jane Austen, it throws itself into an exquisitely crafted universe that successfully marries the whimsicality of fantasy with an in depth look at good versus evil. This older middle-grade/young adult hybrid novel is sure to capture and wow audiences young and old. 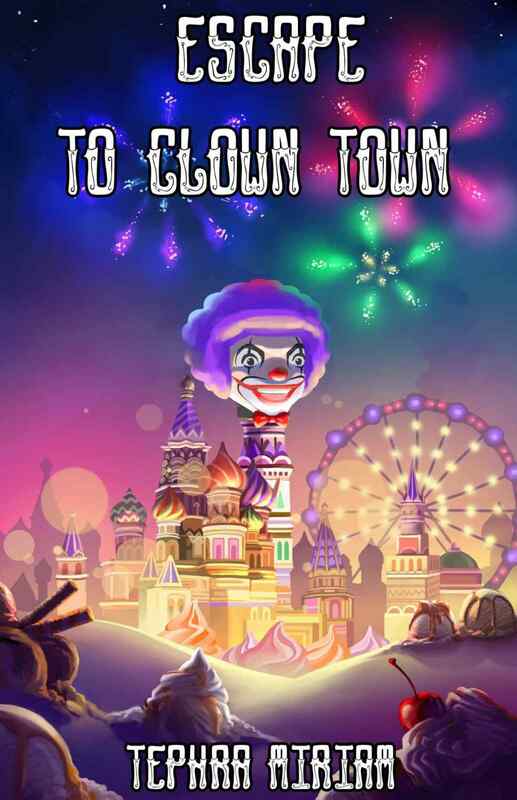 “Escape to Clown Town” is available in full color (ISBN:978-0-9996415-0-7) where books are sold or visit Amazon.com. General Sharaya touched Duchess’ dark brown hair as she lay weak and dying on the cold stone floor of their jail cell. The dark star Epsilon Eridani finally succeeded in taking her star stone. Duchess has yet to learn that General Sharaya is her cousin and that she herself is Faree. 18 year old Duchess is a simple village girl that has no idea that she is at the center of the most epic war of the ages that is soon to come. Duchess tries desperately to escape her village upbringing and dreams of becoming a dancer in the famous Royal Clown Ballet. Duchess has not been told the truth about her royal fairy lineage and falls victim to a universal plot; conjured by the dark star Epsilon Eridani. The clowns easily ensnare Duchess by seducing her with the life she’s always dreamed of. After Duchess escapes her kidnapper, she wakes up in the grandest room she has ever been in. When she gets up to look out of her window, she realizes that she is in the Grand Clown Plaza Hotel located in the center of Clown Town. King Clownington quickly learns of Duchess’ arrival to Clown Town and immediately plots with Epsilon on how to extract her star stone. Epsilon learned from killing many fairies that star stones must be freely given in order to retain their power and cannot be extracted under duress. King Clownington orders his son Jax to court Duchess and the entire clown family does all that they can to trick Duchess into sacrificing her stone. Duchess falls in love with the king’s son but starts to grow suspicious when she tries to leave Clown Town and is not able to. General Sharaya sends Duchess a seemingly cryptic message about the clowns that Duchess fails to understand, until it’s too late. With the universe on the brink of a war that has the power to penetrate space and time, will Duchess become trapped by her hatred of the clowns or freed by her new found destiny? Current racial tensions and the massive political divide in today’s America have created a volatile atmosphere for American youth. “It’s time that we use creativity and imagination to pull us into a new era.” Miriam says. CHICAGO – April 3, 2019 – PRLog — Book 2 in Tephra Miriam’s Clown Town Adventures fantasy fiction series for tweens and teens is a diverse and fearless action thriller that challenges readers to think about influence and stand strong in the face of opposition. Tephra Miriam is continuing to pave the way to diversify the fantasy fiction community. 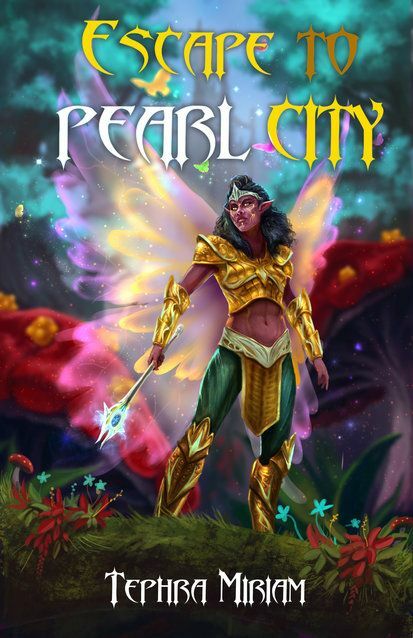 “Escape to Pearl City” is the second book in her fantasy fiction series for young middle-grade and high school aged students. “In order to rise above poverty, destitution, segregation, bias and prejudice we have to have a vision to hold on to like the rising of the sun. My hope is that my writing helps those who have no opportunity, see the world of possibilities.” Miriam commented. Book 2 in the Clown Town Adventures series is due to hit the market in June 2019. “Escape to Pearl City” is available in full color on Amazon.com. Duchess looked over at the large purple gumdrop running beside her in despair. Her head wouldn’t stop pounding and sweat began to burn her eyes. I must be dreaming, she thought to herself. The sound of General Sharaya’s voice quickly reminded her that she was very much awake, but all Duchess could remember was lying on a hard cement floor in the dark dungeons of Clown Town. Even though Duchess finally finds out the truth about the nature of Jax and the clowns, one true friend comes to her rescue and the journey to Pearl City begins. The celestials and fairies find themselves battling ancient dark forces more powerful than even the dark star Epsilon Eridani, that seek to unite the thirteen heavens under the dark deity, Iona Draconis. Mancai the sorcerer emerges from his dark exile, and with the blessings of the lords of darkness, seeks to complete Epsilon’s mission of gathering the thirteen star scrolls and unlocking their power. Despite being subject to the oppression of the deylai and Martian forces, Measles finds a long-lost friend and travels the universe in search of the true meaning of loyalty. Even though the tanatoorian Pirate Captain Naman helps Measles and his new friend Popcorn navigate the troll fields, the clowns end up in the middle of the epic conflict between the immortal celestials and the dark stars. As the Queen of all stars Felanthiam Celenamis rides her great celestial dragon into battle, the fate of the heavens of light lies in the hands of a simple village girl, but a prophecy told by the dead souls of Lyanthra may snuff out the light in all thirteen realms of space and time. When the prophecy is fulfilled, and the ancient supreme sorceress Vangemtra rises from the dead, all beings of the thirteen heavens wonder if war between the heavenly realms will plunge their worlds into darkness forever. The book reel created by TEPHRAMIRIAM Films was was selected as both a feature and staff pick on BookReels.com. Escape to Clown Town was selected as a feature for Book Reader Magazine. Tephra Miriam partnered with Junior Achievement of Chicago for Volta Elementary School’s Career Day earlier this year. Over 100 middle-grade students were exposed to learning about being an entrepreneur and what it takes to bring a story to life. Tephra discussed every component of authorship from concept and design to editing, publishing and communications. Junior Achievement’s Career Days provide students with exposure to diverse college and career paths. Mentors have the opportunity to share words of wisdom on how to navigate college and careers. I tried to leave every student with one big takeaway. I told them that you often don’t have to look too hard to find what you’re good at. Tap into what you are passionate about now and weave it into your future. Tephra Miriam spoke with Judy Hoberman on her weekly live program, ‘Selling In A Skirt‘ on W4WN. The show streams live weekly at 12:00PM CST. Tephra discussed her path to building her business, the power of storytelling and the obstacles that women often encounter in building their own businesses. Women shouldn’t feel that the only option they have for success is to climb the corporate ladder. Never be afraid to live your dream and invest in yourself. As women we need to support each other and drop the Titanic mentality. It’s not every ‘man’ for themselves. We have to support, invest and sponsor each other. Our success is collective as a community. It’s about all of us being a force and standing as one, together. Be sure to tune into this powerful talk that focuses on women in business. 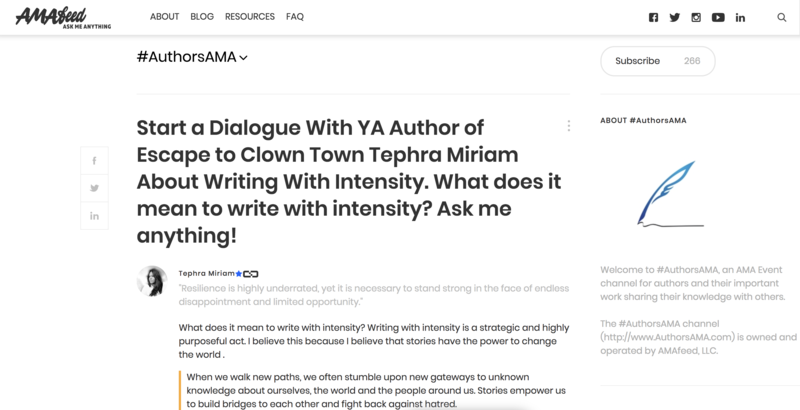 Tephra Miriam hosted an AMAFeed discussion on what it means to write with intensity. Tephra interacted with over 40 different people that asked questions about her writing, publishing and creative process. Writing with intensity means to write with purposeful strength, power, potency and force. It’s what lies beneath the basic intention and grammatical construct of writing and turns writing into a tool for change. AMAFeed has reinvented interviews. An Ask Me Anything (AMA) Event is an authentic way to raise awareness to the things and causes that matter to you most. Whatever your story is – there is always someone who can benefit from it and learn from your ups and downs. And you – you get a great feedback and insight into what sparks people’s interest and get to connect with like minded folks from around the globe. Tephra Miriam spent the day at the Children’s Book Fair of Hyde Park talking with members of the community and signing copies of her new book Escape to Clown Town. The Children’s Book Fair began over 30 years ago as a back-to-school celebration. The Fair has grown every year since its inception, and now hosts dozens of local booksellers and community organizations. Escape to Clown Town was featured in Majenicawrites.com’s craved 2018 holiday gift guide. This feature was part of TEPHRAMIRIAM Publishing’s first Give the Gift of Reading holiday campaign. Lifestyle blog Life With Kathy featured Escape to Clown Town in their 2018 holiday gift guide along with a rave review of the book. Fupping is a revolutionary up and coming content creation platform. The world of online media is a constantly changing and evolving landscape. Fupping aims to revolutionize the industry by putting the power to create back in the hands of the readers.